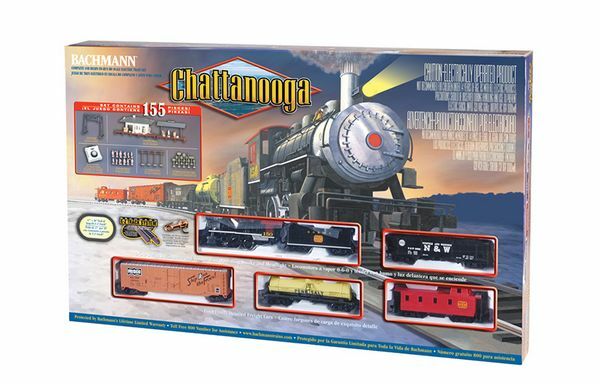 The BA00626 Chattanooga is a Complete and Ready-to-Run HO Scale Electric Train Set from Bachmann. The BA00626 Chattanooga is a Complete and Ready-to-Run HO Scale Electric Train Set from Bachmann. Suitable for Ages 8 and Older. A large oval layout of Snap-Fit E-Z Track® including a plug-in terminal rerailer section. The smooth-running Nashville, Chattanooga & St. Louis 0-6-0 engine has an operating headlight and smoke unit. Accurately depicted coal tender, plug-door box car, open quad hopper, single-dome tank car and off-center caboose. Locomotive and cars equipped with E-Z Mate® Knuckle Couplers. Power pack and speed control with plug-in wiring, power indicator light and direction switch. Set up and operating instructions. COMMENTS: Easily expand your layout with more E-Z Track® (BACU6674).